Oven roast the red or sweet onion until soft and chop up. Lightly chop the blueberries. We quickly pulse them, about a cup at a time, in a food processor, smoothie maker, or blender. Do not puree or pulverize them! 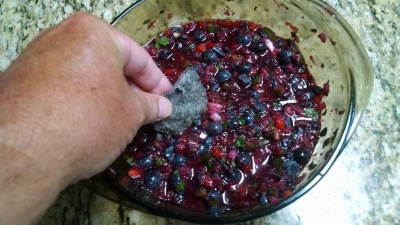 Some berries may remain whole and that's OK! Stir together all ingredients in a large bowl, cover and chill until ready to serve. Serve with something crunchy like pita chips or tortilla chips. This one is just incredible.